Departing Pile square on foot toward the newly open Cable Car Station situated in vicinity of the Old Town of Dubrovnik. Upon arrival to the Cable Car Station you will proceed with a cable car to a panoramic view of Dubrovnik from the surrounding Srd hill. 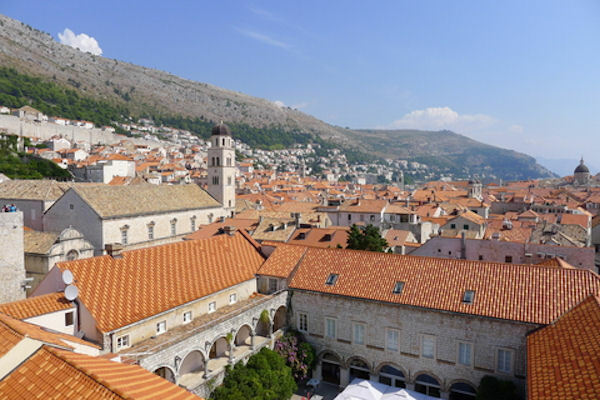 From here you will be offered a bird’s – eye view of the greatness of the entire city and surroundings of the centuries – old Dubrovnik rooftops which you will never forget. Upon return ride to the main Station your tour guide will lead you by foot to the Old Town of Dubrovnik for the walking tour. Walking tour will open the doors to you to one of the largest and most luxurious open – air museum towns in existence. The famous Croatian tourist centre awaits you, encircled by its monumental stone ramparts, which have preserved and enhanced Dubrovnik’s spirit of Renaissance. You will be awed by the labyrinth of short, narrow stone streets, the market place, palaces, towers, monasteries and houses, each of which is over 300 years old! The old masters understood how to construct a miraculously harmonious stone city. This harmony, simplicity and sense of beauty have through the ages become the basic philosophy of life for the residents of Dubrovnik. Dubrovnik was the bridge and diplomatic liaison between the east and west. It has been subject to fires and catastrophic earthquakes, but has always risen again like the “Phoenix” to retain its renown as world – famous treasury of cultural monuments!